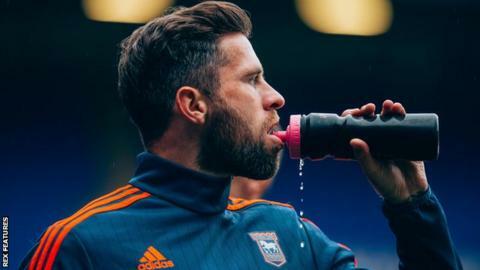 Ipswich boss Mick McCarthy joked Daryl Murphy's sister can stop masquerading as him after the striker ended his goal drought at Rotherham on Saturday. Murphy had yet to score this term, but netted a hat-trick in the 5-2 victory. "I said 'welcome back Murph, we don't want to see your sister again who's been playing in recent weeks'," McCarthy told BBC Radio Suffolk. "You can get away with that when he's scored a hat-trick - 'leave your sister at home and you come regularly'." Republic of Ireland international Murphy, 32, found the net 27 times in 48 games last season, helping him finish as the Championship's top scorer. But before Saturday's trip to Yorkshire he had failed to score in 15 matches for club and country this term. His first hat-trick in English football finished that drought, just before he joins up with Martin O'Neill's Republic side for their crucial Euro 2016 play-off matches against Bosnia and Herzegovina. "It hasn't really been bothering me because I'd been getting chances, but just been unlucky in front of goal," Murphy said. "I think if I'd have been younger it probably would have weighed on my mind a bit more, but with experience if I'm getting in good positions and getting chances then I know one will come eventually. "If I'm not getting chances then that's when I'd start to worry."